We did it! 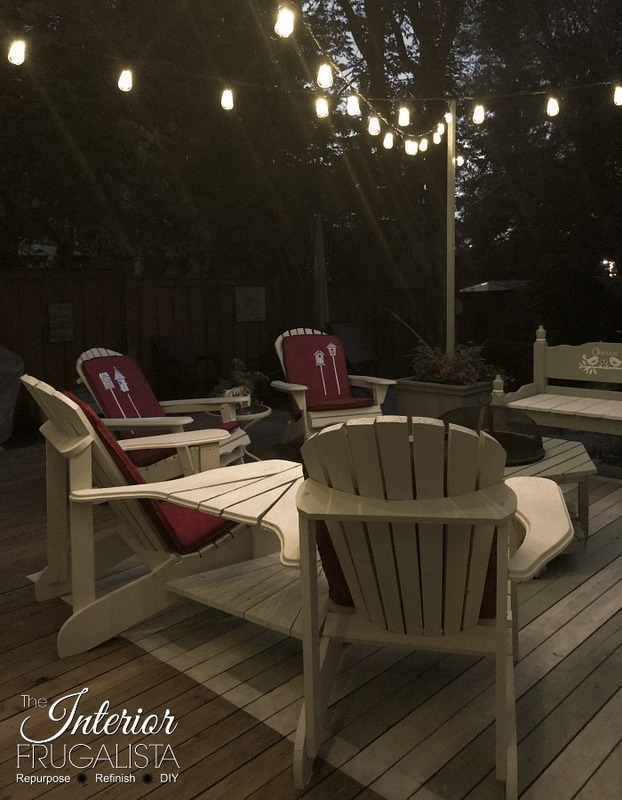 Finally, we've come to the Budget-Friendly Deck Makeover Reveal and series finale, where one DIY project at a time we created a cozy and inviting conversation area on our backyard deck with a beer budget. 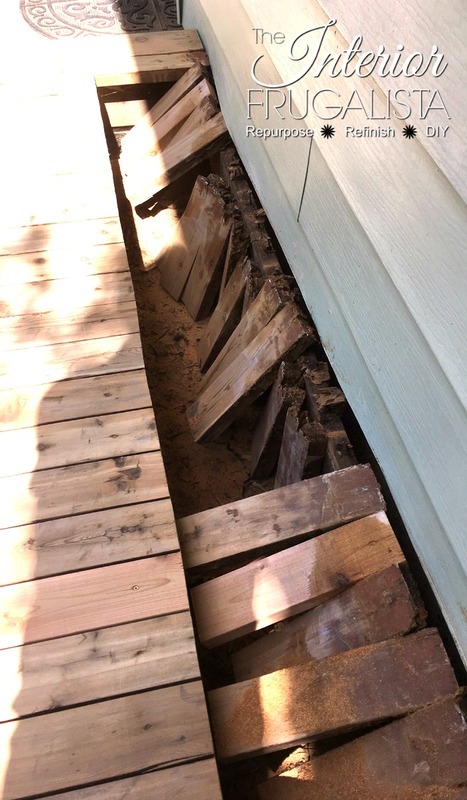 But first, it required an unexpected deck restoration. 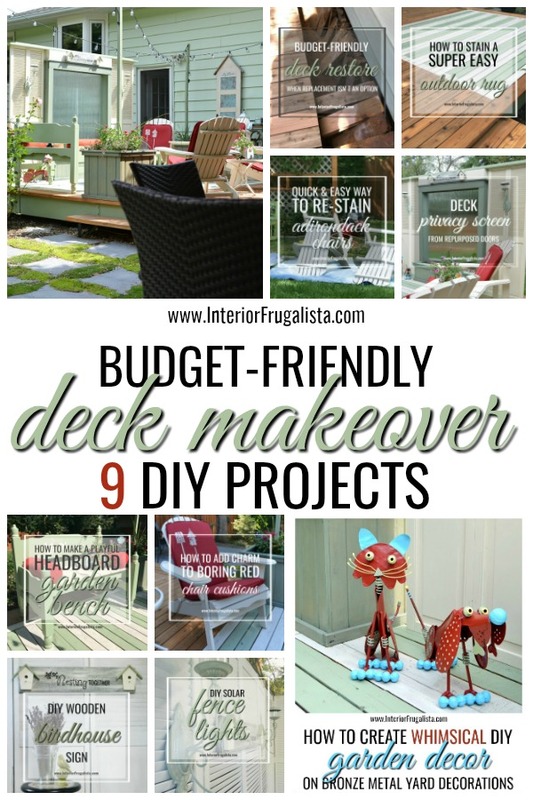 Let's begin with a recap of all nine DIY projects, shall we? We'll get to the pretty after photos and night time shots towards the end of this post. 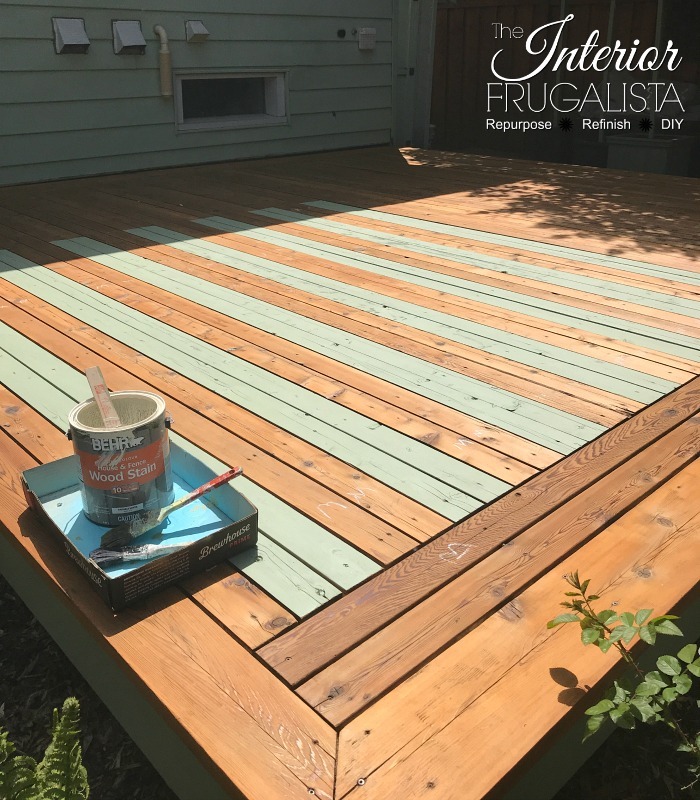 It all started one early morning in June when the plan was to power wash and restain our deck until discovering some rotting deck boards. And then a whole can of worms opened up after that. 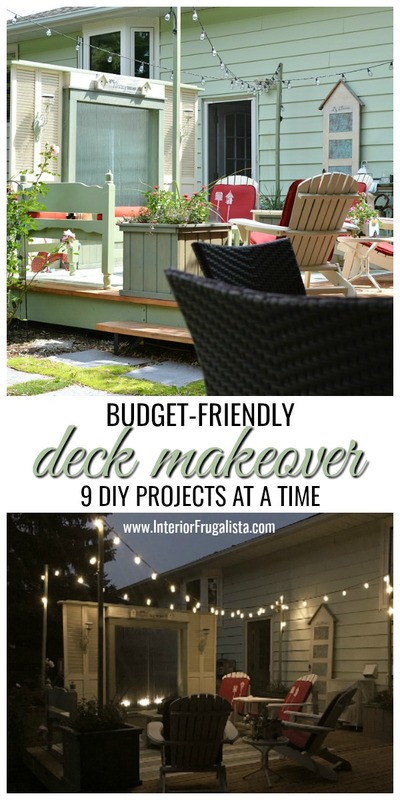 Not in the budget to replace the entire deck, we came up with a budget-friendly way to restore it for around $400. 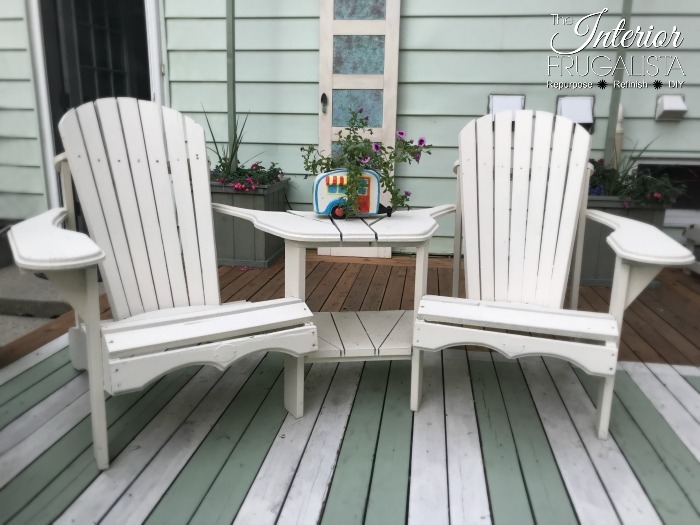 After the deck was restored I painted an outdoor area rug with stain. 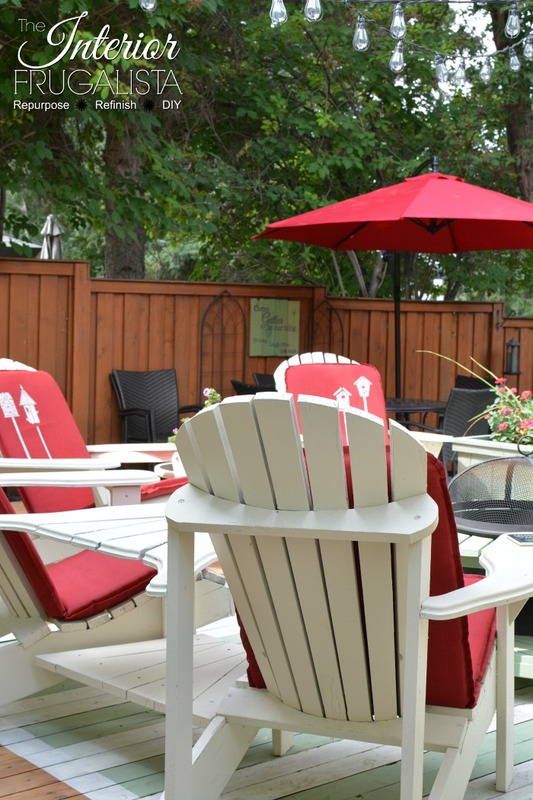 Unfortunately, here in the Canadian prairies, textile outdoor rugs take a beating. 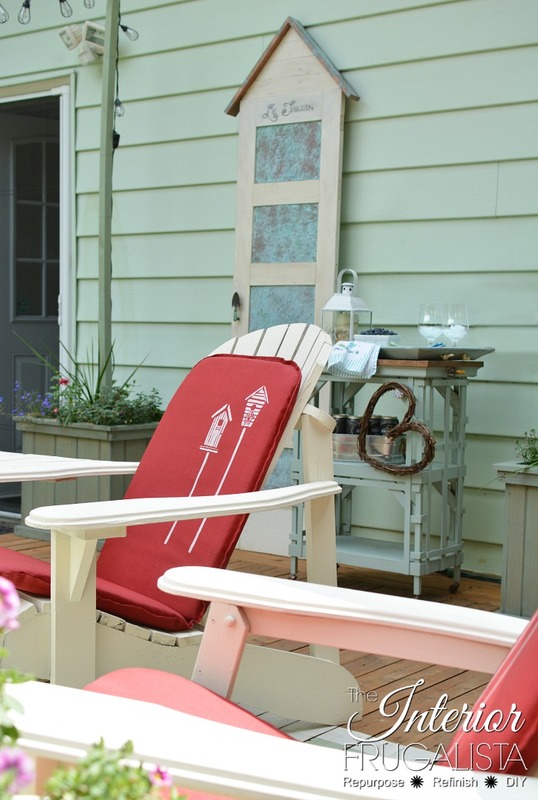 Another project on the list was refreshing our Adirondack Chairs, Tete-a-Tete, and Fire Bowl Table with stain. 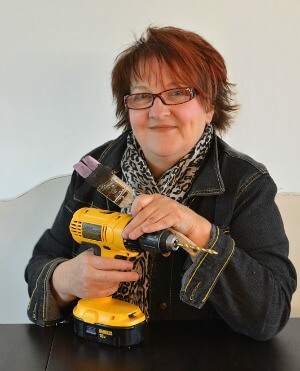 Saving our sore backs and loads of time, we had all four pieces finished in an afternoon and I share how. 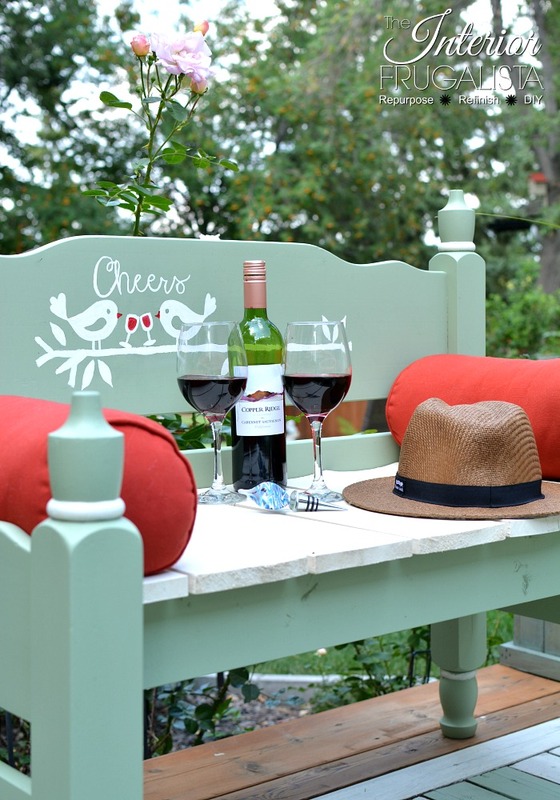 Needing more seating in this space we repurposed a twin headboard and footboard into a garden bench for two. 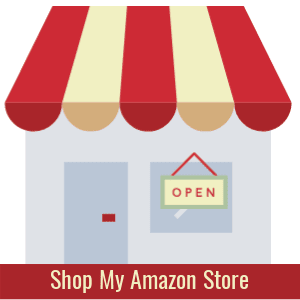 In that post, I share a detailed step-by-step tutorial on how to build one. 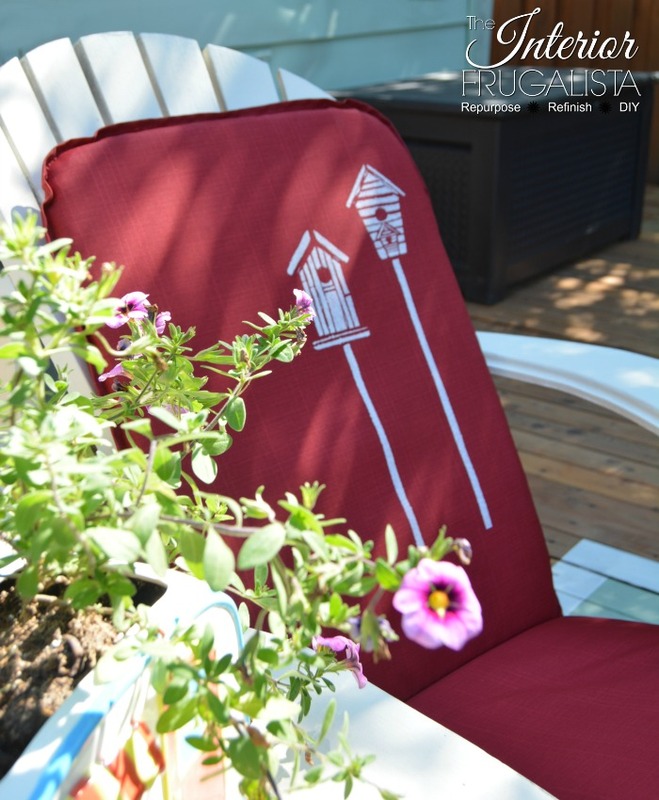 Looking everywhere for Adirondack chair cushions that didn't cost at least $50 per chair, I found a budget-friendly alternative at WalMart. Unfortunately, the ones with a pattern where the wrong colors for our space so I purchased these solid red ones instead. 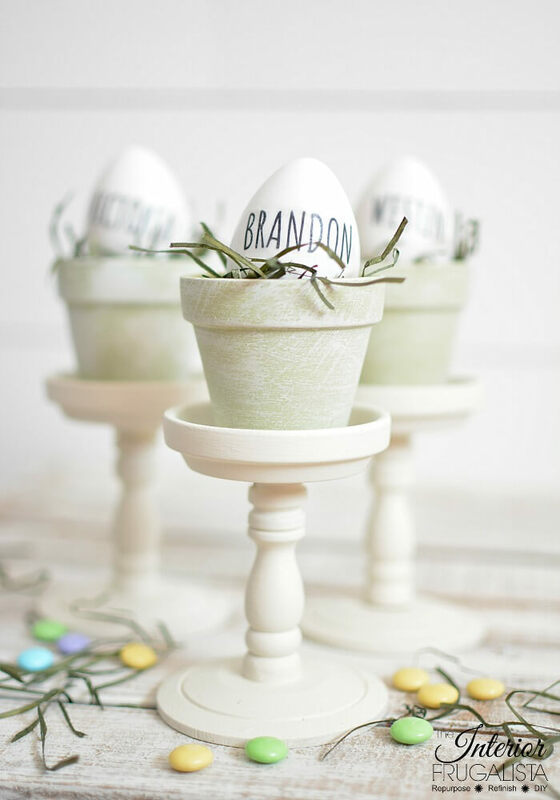 Finding them rather plain, I added some unique charm and it was so quick and easy. 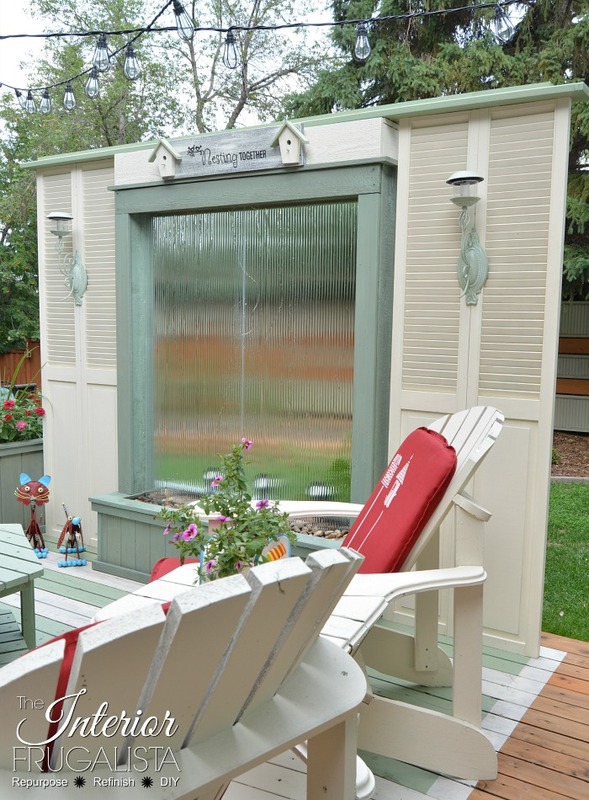 When you want privacy while enjoying your backyard deck but building a pergola isn't an option, here's a budget-friendly way to build a privacy screen from old bi-fold doors. 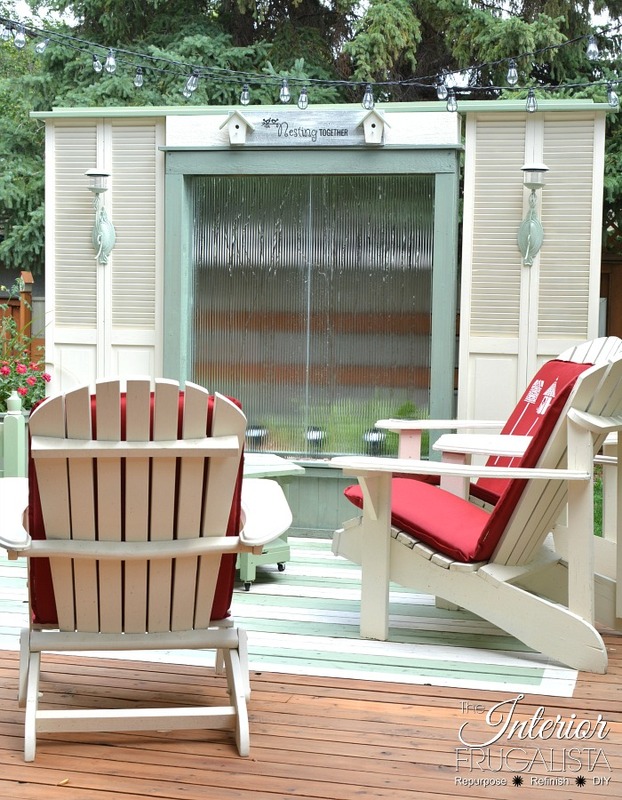 The water wall in the center is optional but I do share a link to the detailed tutorial on how to build one. 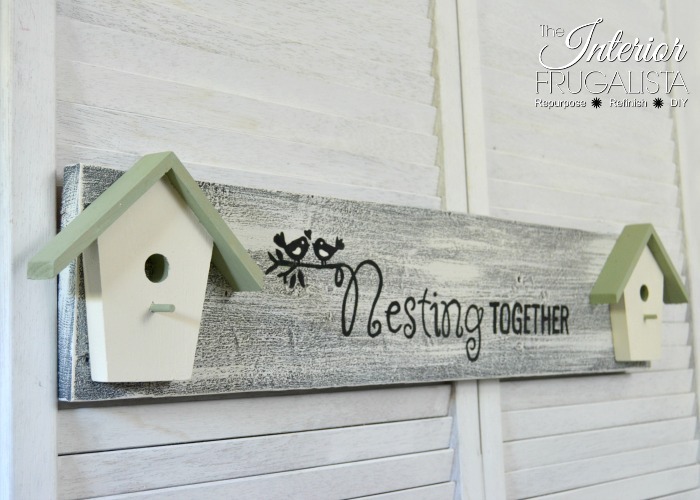 I had no intention of creating a bird theme on the deck but it sort of evolved, starting with this wood birdhouse sign. 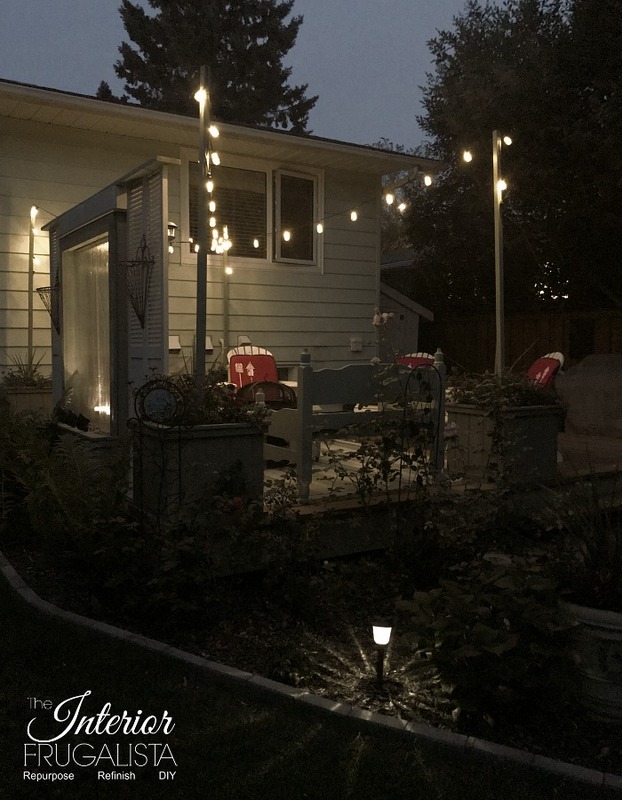 Wanting solar lights to hang on the privacy screen, I made these unique ones by marrying metal candle scones with dollar store solar lights and I show you how easy they are to make with a detailed tutorial. 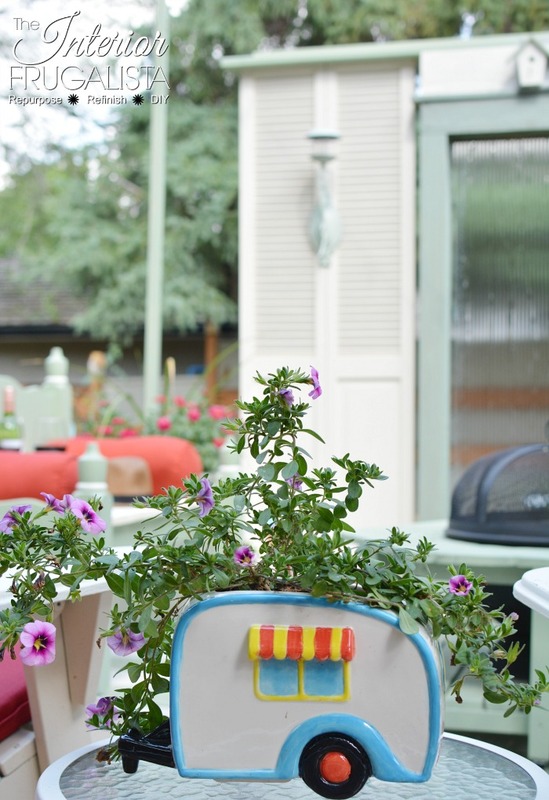 Last but not least is the fun garden decor inspired by a vintage camper flower pot I painted at a ceramic studio. 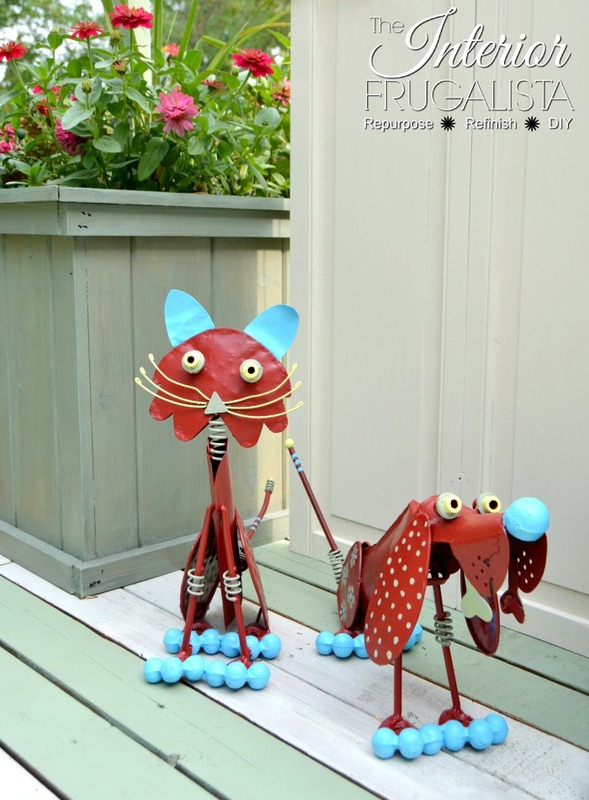 I loved how the happy bright colors looked on the deck and so I transformed a couple of bronze metal garden animals that I had in our fern garden for over 20 years. 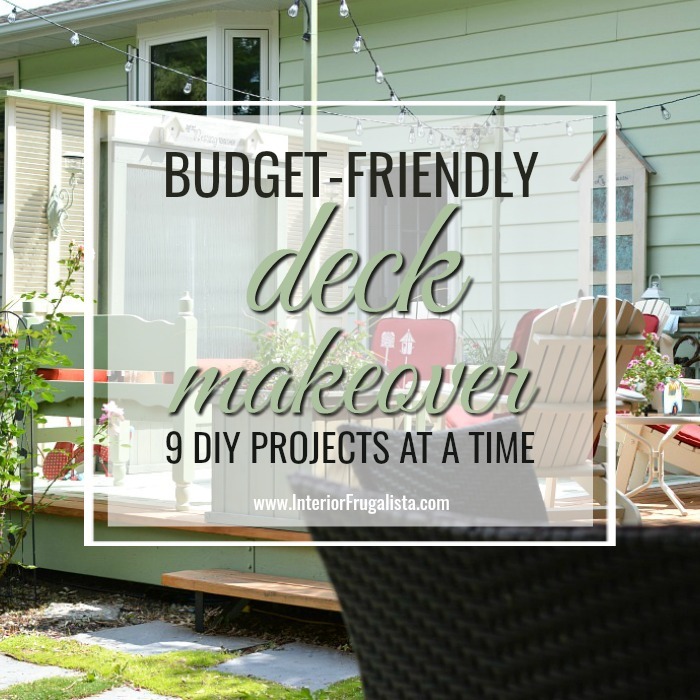 After weeks of hard work and nine DIY projects later, here are photos of what our new budget-friendly deck makeover looks like now. 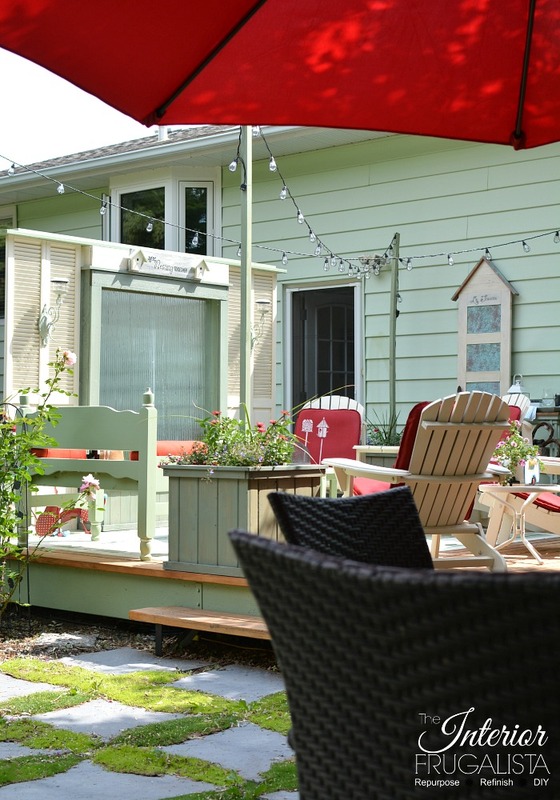 Thankfully we have one more month of summer left to FINALLY enjoy our new deck space. I hope you like it as much as we do. 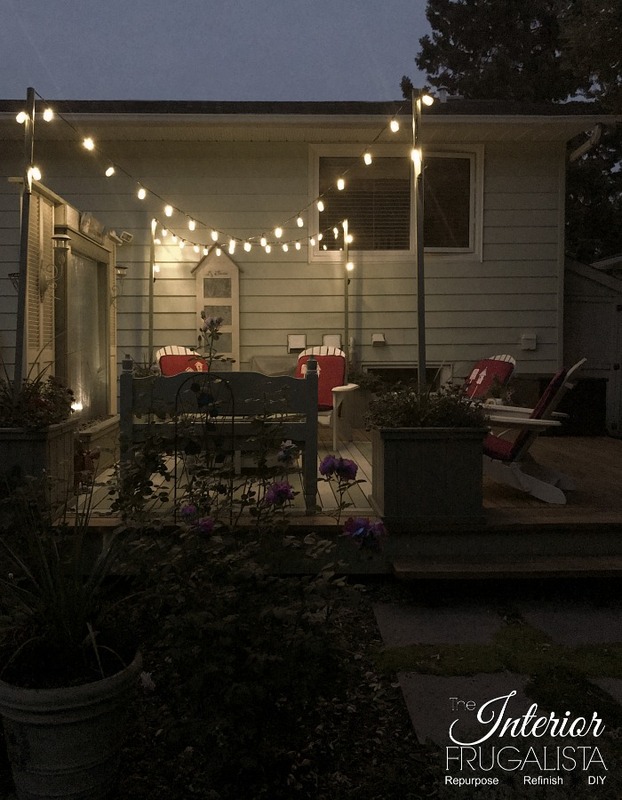 One DIY project I didn't include in the series was the string lights hanging from poles mounted in four wooden flower planters. That's because we're not 100% happy with the results. For one, we cut the posts too short so if anyone over 6-feet tall stands underneath they'll have cage lights up their nostrils. The other is that the 2" x 2" posts are too skimpy and despite being mounted in concrete, are being pulled sideways from the pressure of the light strands. Replacing the posts with 4" x 4" is a project for next year. 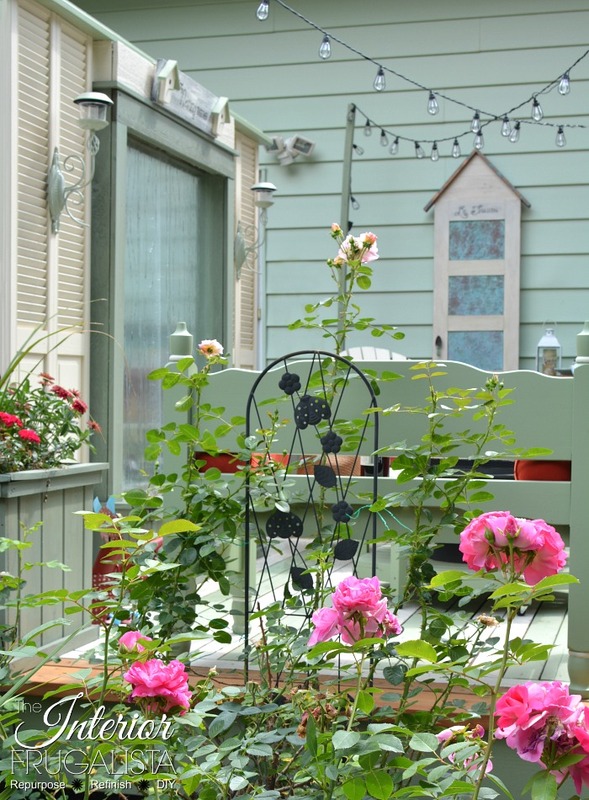 The Le Jardin Repurposed 5-Panel Door Flower Planter (pictured below) is another door project from a few years ago. 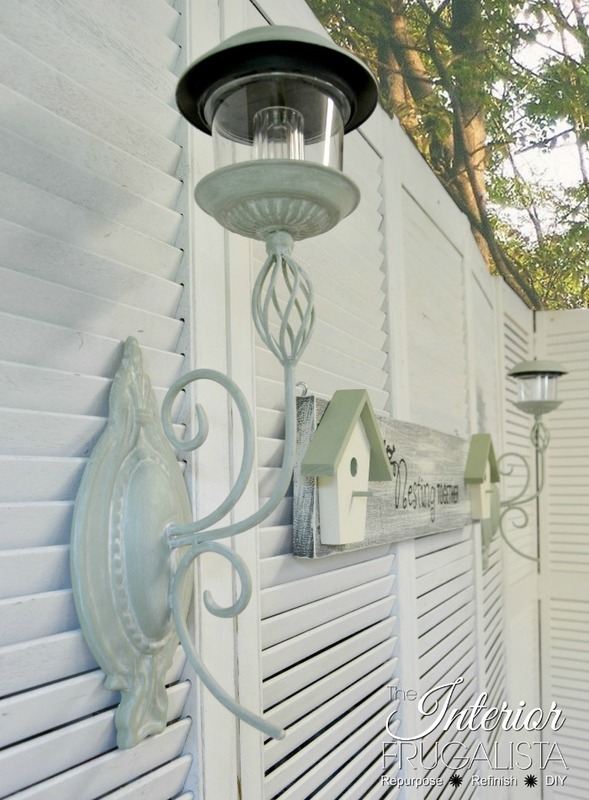 The tin panels are faux oxidized copper. 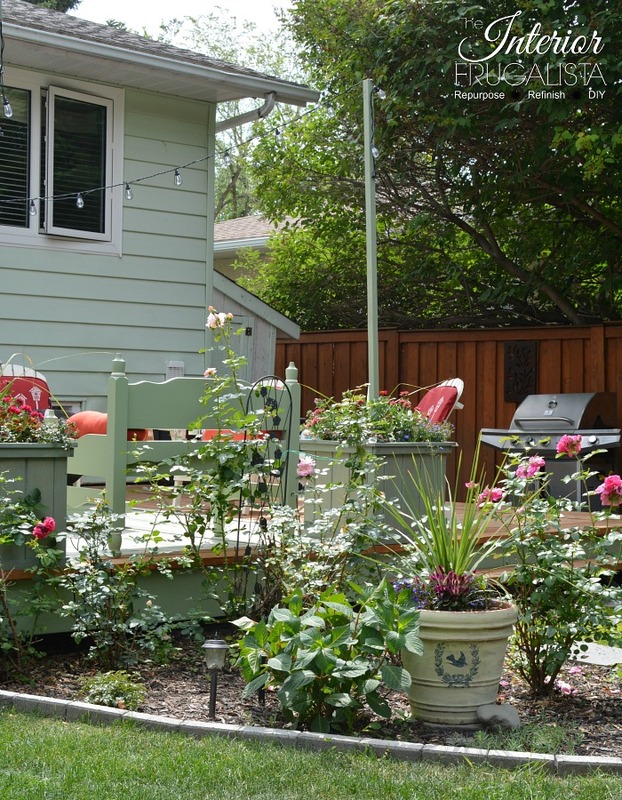 The flower pot base is missing because it was too late in the season once we finished the deck to plant anything. Next year! 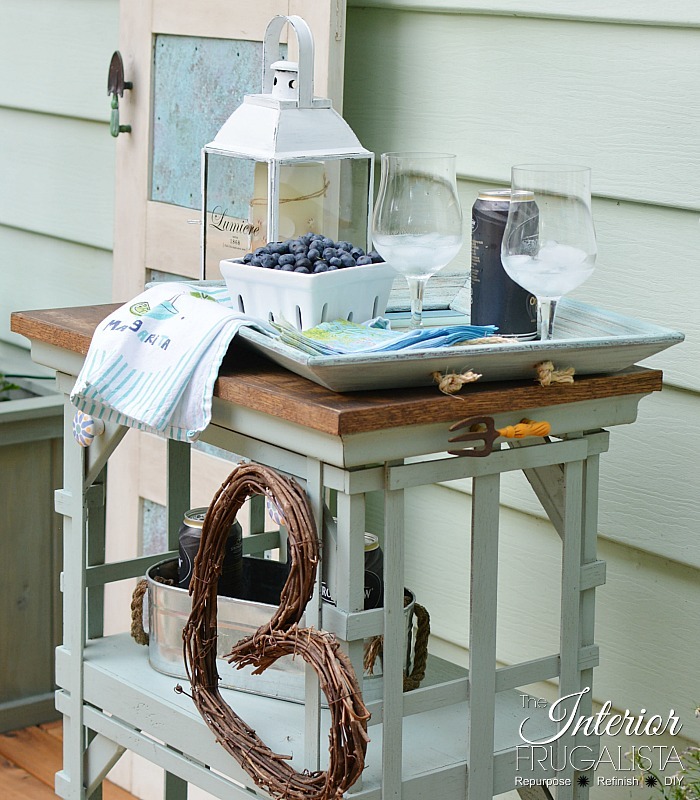 The beverage cart is another DIY from a couple of years ago where I turned a small shelving unit into an Outdoor Portable Bar Cart. 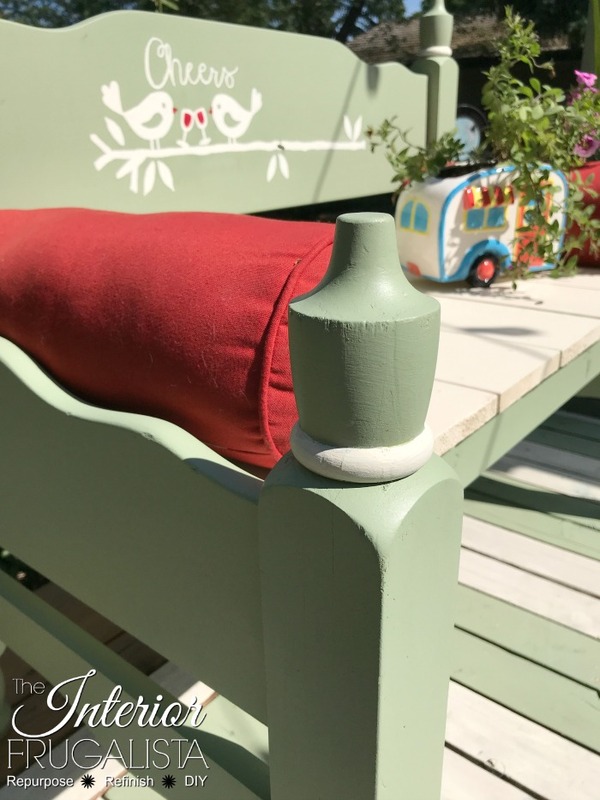 The Coastal Picture Frame Serving Tray was also a DIY project from the Spring where I repurposed a dilapidated and weathered picture frame chalkboard. 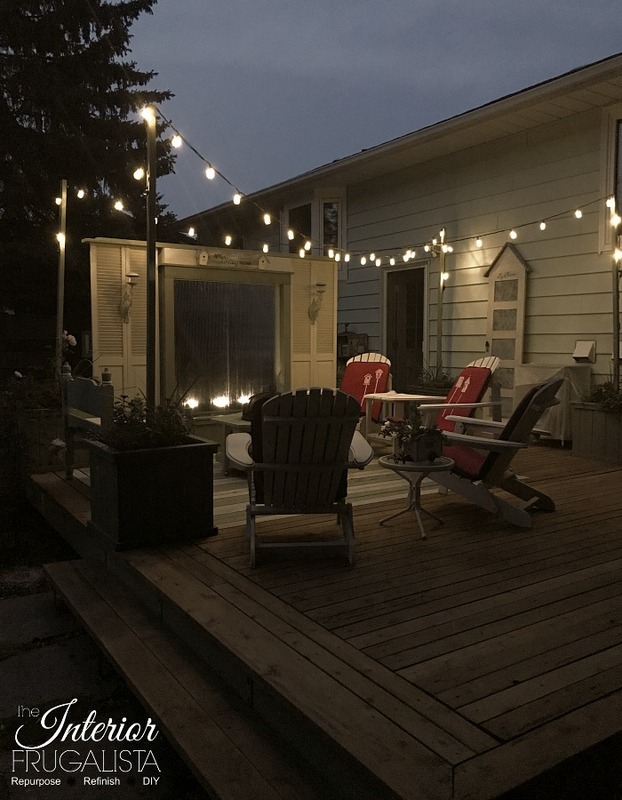 Here are a few views of the deck at night illuminated by the stands of string lights.